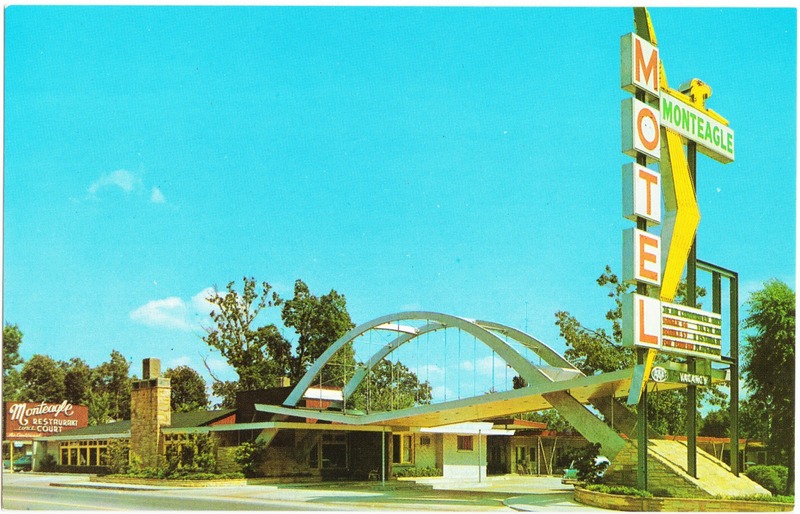 "Long-Gone Mid-Century Motels" is one of my favorite subcategories in postcard collecting. How else will these travelers' havens be remembered? Here are three old cards, along with the hotels' biographical data, from the reverse side. If you have memories of any of these places, please share them in the comments section. "38 Air Conditioned Units with TV — 100 seat Restaurant. A good nights rest atop the highest point between Chicago and Miami on U.S. highways 41 and 64. Spacious Lobby, Recreation Room, Swimming Pool, Playground, and Gift Shop. Phone WA 4-9461." CURRENT STATUS: Razed within past half-decade to make way for a CVS, per Vanishing America. About Monteagle, from Wikipedia: "Monteagle is most famous for the treacherous stretch of Interstate 24 that passes through the town. It is here that the highway passes over what is colloquially referred to as 'The Monteagle' or 'Monteagle Mountain', a section of the southern Cumberland Plateau which is a major landmark on the road between Chattanooga and Nashville. The interstate regularly shuts down in inclement weather, routing traffic onto U.S. Route 41. In the Jerry Reed song 'The Legend', which is the opening track in the film Smokey and the Bandit, Reed tells the story of the Bandit miraculously surviving brake failure on the 'Monteagle Grade.'" "THE NORMANDY. St. Augustine, Fla. 304 San Marco Ave. and U.S. 1. Quiet — Comfortable — Central Heating System — Air-Conditioned — Television — Restaurants Within Walking Distance — Moderate Rates — Phone 824-2802 — Mr. & Mrs. David S. Brilhart"
CURRENT STATUS: Unknown. But it's almost certain that the original building is no longer there. "ALAMO PLAZA COURTS. South Suburbs, U.S. 70 and 41, Nashville, Tenn. 96 rooms, tile baths, carpeted floors, 24 hour telephone and bellboy service, Beautyrest, electric heat, 100% Air-Conditioned, convenient restaurants. CLEAN, The World's Best Housekeeping. Free Swimming Pool — Free TV." This one was part of a bit of history. 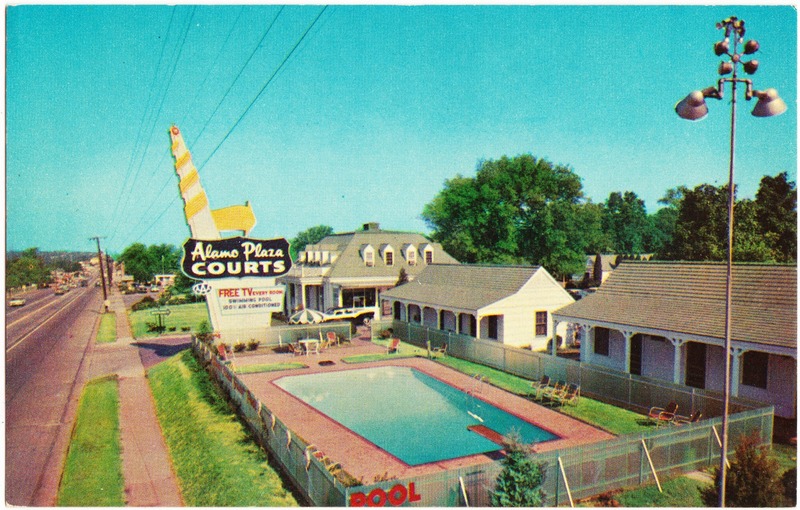 The Alamo Plaza Hotel Courts were the first motel chain in the United States, having been founded in Texas in 1929. 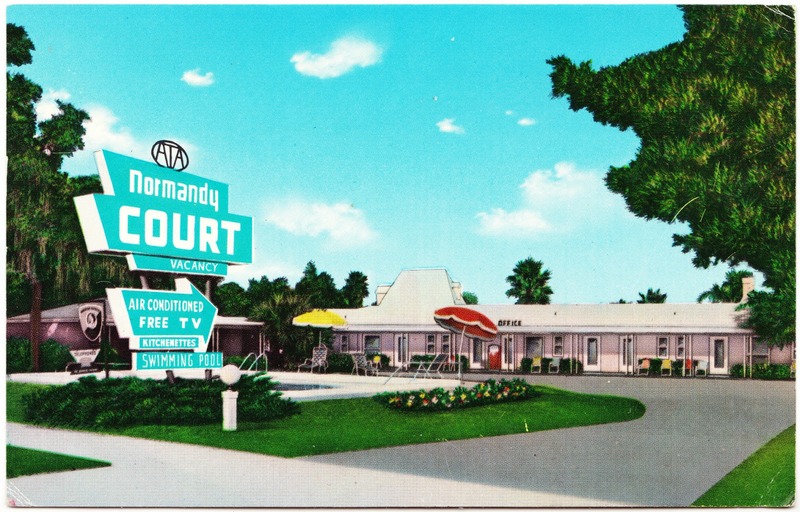 There were about two dozen locations across the southeastern States, many of which used common branding and architecture. Info on the Nashville location, per Nashville author Scott Faragher, via Wikipedia: "Opened 1941 by E.L. McLallen, these 'Alamo Plaza Courts' did not use standard Alamo architecture but were Colonial Revival with columns at all entranceways, chimneys and dormers on the two-story office building.